Shoalwater has been complete and blocked for over a week, and has been worn almost everyday since. I love this, I think its my favourite big knit so far. This is down to the yarn used in a big way I think. The colours really do suit it and the yarn drapes nicely but its not too delicate either meaning I am not too scared to wear it often. You can see the colours nicely in this first picture i think. and here it is in all its watery glory! It blocked out to be a rather huge piece, it was really quite small and scrunched up. 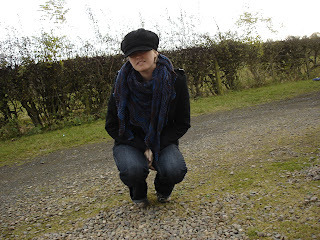 The other nice thing about this yarn is that it seems to hang on to the scent of whatever you wash it in, which is rather lovely and comforting when you are wearing it around your neck. A special thank you and a round of applause to the budding pap too who is my four year old son Conor! Which is why I was crouching down, when I stood up most of the pictures looked black as he had to tilt the camera upwards to get me in. Didnt he do well. well i think for a 4 year old, he actually did really well. i wouldn't say that bad at all. i took two of them and worked them in photoshop to lighten them, but i have a monitor that tends to blow everything out so if you like the lightened versions try them. i also did it without my glasses on i just realized so i hope they are ok.
Great shawl and great photos Conor! Cairi that's great! You must be pleased with it. That looks gorgeous! And what a fab photographer. Great shawl! And Conor did very well with the pics. Well done both of you! Congrats on the fabulous FO! It is a beautiful shawl! 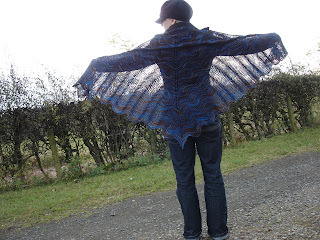 Great shawl and great pics! And very well done Conor! wow! it's fab! and Conor has done a great job with the piccies.